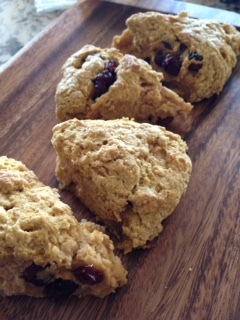 A little bit of butternut squash goodness in these cranberry scones make them moist and great tasting. 1. In a large bowl, combine flour, baking powder, baking soda, and salt. 2. In small bowl, whisk together butternut squash, maple syrup, coconut milk, cranberries, coconut oil, orange zest, and vanilla. 3. Pour wet ingredients into dry and mix gently. 4. Using hands, mix dough and gather up loose flour to combine. 5. Form a circle with the dough and place on prepared cookie sheet. Slice the dough into 6 or 8 wedge-shaped pieces, but do NOT separate. 6. Lightly whisk egg with 1 teaspoon of water. Brush top of dough with some of egg mixture. Discard rest of egg mixture. 7. Bake at 400° F for 20-25 minutes. Check center of circle for doneness. 8. Let cool. Separate wedges and serve.